EXTENSIVE USES：These artificial plants can bring your space green and fresh so that they are popular in office, home, bedroom, living room, bathroom, kitchen, balcony and other furniture decorations. – Still don’t know how to decorate your office or home? – Still confuse what gifts can delight your family, friends or lovers? – Come and see it! 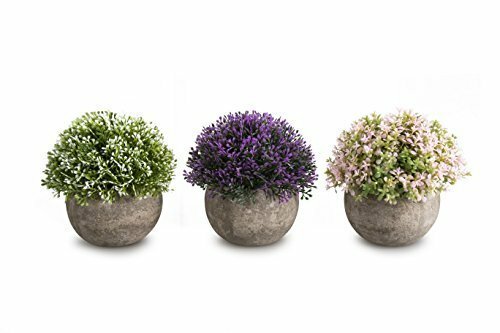 – OPPS Mini Artificial Plants Set can be your PERFECT CHOICE! We do provide 100% OPPS Satisfaction Guarantee and back up with 60 days warranty (defection, accidental damage, non-satisfaction), so don’t worry about the problem of transport damage. If you are still have any questions, please contact me in time! We cannot guarantee this sale price for long – Be Sure To Click “Add to Cart” Now! SIZE: 4.3″X4.7″(W*H). (From top tip of the plant to the bottom of the pot). Set of 3.